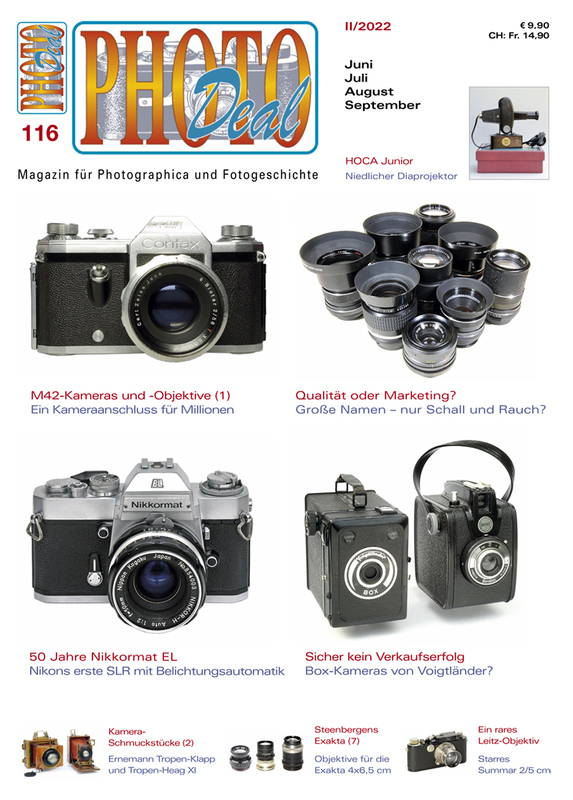 PhotoDeal, magazine for photographica, second hand cameras und collectors of photographic specialties. PHOTODeal - magazine for camera enthusiasts and collectors of photographica. PHOTODeal is available in German language only. All links below refer to pages written in German. For those who regret that the contents of this magazine are in German language only I would like to point out that I am strongly interested in a cooperation with a native English collector, publisher or distributor to establish an English edition of PHOTO Deal magazine. As there is nothing comparable available in English language except club magazines to which only the respective members have access I see quite a promising demand for such a venture. A possible partner could either be an ambitious collector who is interested to build up a (new) existence or an editor or publisher of another photography magazine or publishing company. The entire contents are available digitally including the photographs which could be exchanged on a CD-ROM, the layout is done with a Power Mac in Quark XPress. With regard to the huge number of international collectors may they live in the UK, the USA, Australia, Asia or whereever English is spoken or at least understood I am convinced that this magazine has an enormous potential which would make an interesting business for the cooperating partner regarding the sale of subscriptions as well as commercial ads. Any serious suggestions are appreciated. Please contact me by phone (0049-2137-77676) or by eMail. Thank you. PHOTODeal is a photographic full color magazine for collectors, camera enthusiasts, nic-nac hunters and tech-freaks, published in German language. PHOTODeal is published quarterly and distributed throughout Germany and the neighbouring European countries, particularly Switzerland, Austria and the Netherlands with a respectable number of subscribers overseas who appreciate the unique concept of this magazine published by Rudolf Hillebrand. At present, PHOTODeal has approximately 1.300 subscribers. PHOTODeal is also integrated in the magazine and newspaper distribution service in Germany. This includes more than 250 bookshops and news stands at railway stations as well as selected newspaper kiosks and, of course, the magazine is on sale at camera fairs and selected photo dealers throughout Germany. PHOTODeal covers the complete spectrum of collectable cameras of recent years as well as the milestones in camera design. The magazine also relates to remarkable current cameras and their important accessories. PHOTODeal includes articles and photographs in full color on collectable cameras by noted collectors and photo historians. PHOTODeal has a regular dealer profile on some of the most exciting camera shops in Europe, and the complete calendar of camera fairs and important auctions are included in each printed issue. PHOTODeal has a unique 'classified advertisement section' where readers can buy and sell with complete confidence. Interviews with many collectors and dealers are an important part of the magazine, as well as excellent reviews of all the latest camera books.